This is the first post I will write in English, so please excuse my mistakes. I saw videos on YouTube, where some people, including Mike Maloney in his “Hidden Secrets Of Money”, told us that an ounce or two of gold had bought a house in the past. I think Mike Maloney said, he didn’t search for this, but heard it from the Swiss investor Marc Faber. So I wanted to know if this is a real fact or not. History and specially the history of money was ever interesting for me. For few years I have been living in Germany and I have access to the library of my university, so I started looking for old newspapers. And as many other things, the Germans have done a very good job in scanning old newspapers. It was a bit hard work, because of the old German font used in the books and newspapers. Anyway… in the next lines I will not only present to you some commodity prices, but some other interesting facts in the time before the World War I and the Hyperinflation in 1923. As first I want to show you two of the major currencies in Europe at this time: The Swiss frank and the Goldmark. Switzerland at time was part of the so called Latin Monetary Union. So the value of the Swiss frank was: 1 Frank = 0,290322g Gold = 4,5g Silver. The German Goldmark itself: 1 Mark = 0,358g Gold = 5,55g Silver. At this way you can always determine what was the commodity price in gold and silver. So lets get started! Basler Bank: Interest rate 3,5% – 4,5% House (Between Karlsruhe and Freiburg) = 6 000 M.
Then in August 1914 the World War I started. Weimar Germany needed money to finance the war. And at the beginning of august the gold standard was removed. I found another interesting article : Many business owners didn’t want to accept the Papermarks. They were committed to accept the Papermarks or their localities would be closed. 1919 – So the war ended, Germany have lost and should pay a lot of reparations. The economy was bad and there was a lot of unemployment at this time. If we here make simple calculation: a hotel in the town of Basel costs 185 000 Marks. In Swiss frank about 212 CHF. As I noticed the Swiss frank had a value of 0,290322g Gold. So at that time the hotel really costs 2 ounces of gold. 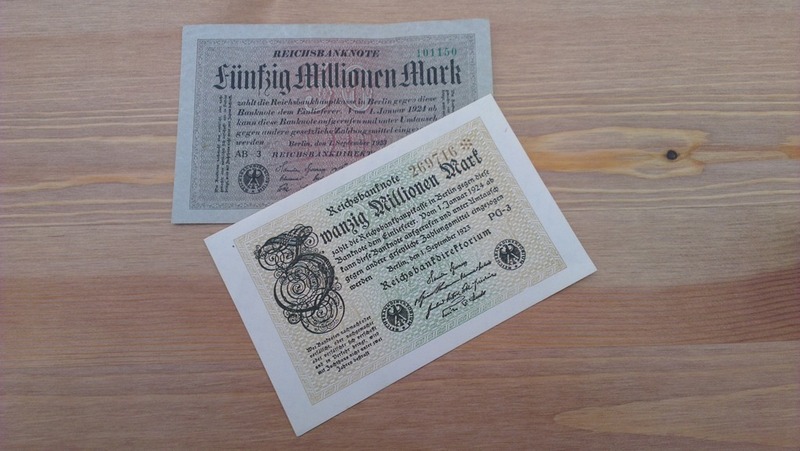 Very interesting fact: At the pick of the hyperinflation in 1923, the people stopped accepting the Papermarks, and accepted again only Goldmarks. So at that time a house costs again as before the war about 288 ounces of gold. So at the end, for every commodity there are picks and downs. It depends on: where the house is, in witch country it is, in witch currency and what the people need more (after a war: house or food) and so on. I hope you will find my post interesting and if so, please share. Thanks and have a good day! Freiburger Zeitung 1913-09-11 Zweites Morgenblatt, Page 3. Freiburger Zeitung 1914-06-02 Zweites Morgenblatt, Page 2. Freiburger Zeitung 1914-06-10 Zweites Morgenblatt, Page 3. ← Колко процента е инфлацията? Very interesting. Thank you for your work!